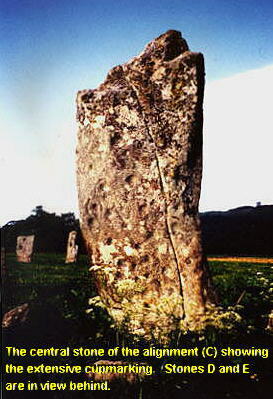 Nether Largie - a description of the important standing stone alignments at Nether Largie, by Temple Wood, Kilmartin, Argyll and their significance in indicating the extreme positions of the moon during its 19 year cycle..
How to find: The site is 1.5km south of Kilmartin village. Take the first minor road on the right going south on the A816, and after 0.5km park beside the Temple Wood stone circles. The standing stones are in the fields opposite the circles, some 250m from the road. Alternatively, there is a car park just off the main road, with Historic Scotland information boards about the site (no explanation about the astronomical purpose of the site though!). Best time of year to visit: Lunar major standstill (see dates). This famous site has been surveyed and analysed by many workers, and it has been suggested that the stones here probably functioned together as a lunar observatory. There are six promininent standing stones in the fields, five of them laid out in an extended cross shape (see plan above), with their axes set north-west to south-east. All but one of the stones are cup-marked, with the distinctive central stone C decorated with 40 cupmarks and 3 cup-and-ring markings. The stones of this alignment are large, all being nearly 3 metres tall. Another smaller stone lies 100 metres northwest of the main group. There are also two smaller square settings of four slabs (see plan), one setting closely surrounding the central stone C, and the other close by to the south. The standing stones here seem to have been erected in a carefully chosen location, so that, together with the local horizons, both the northernmost and southernmost positions of the moon during the major standstill are indicated1. 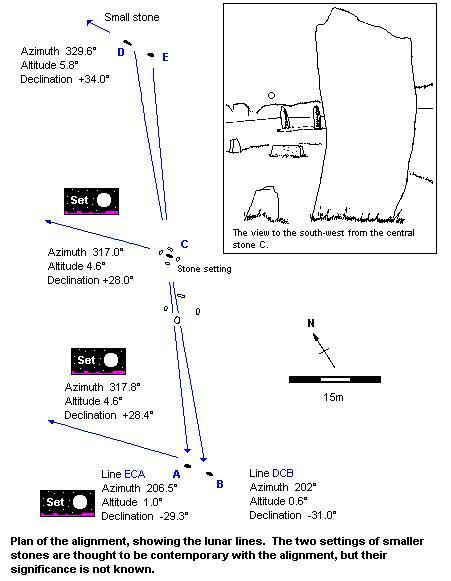 Standing at the southern pair of stones, A and B, and looking to the north-west, an observer sees a ridge of low hills. The azimuth of about 318° with the horizon height of over 4° indicates the extreme northern (midwinter) setting position of the full moon at the major standstill. The flat face of the central stone C also indicates about the same position on the horizon. Standing at the northern stone E and looking past the central stone to stone A, an observer sees (if the weather is clear) Bellanoch hill, over 4 miles distant, on a bearing of 206.5°. The view is partly blocked by trees. This gives the position of the setting full moon at its extreme southerly (midsummer) position. Thus the stones at Nether Largie indicate both ends of the band of western sky within which the moon always sets. The major standstill takes place only once every nineteen years, though the extreme moon would come close to those indicated positions during the months before and after the standstill also. This site is probably the most important and coherent lunar site in Scotland, with no real parallels elsewhere, except with an alignment at Barbreck house, which is now enclosed by buildings and trees. It is worth noting also that the excavator of the two stone circles at Temple Wood nearby suggested that the area of the northern circle there had also incorporated astronomical lines2. Jack Scott believed there had been wooden sighting structures on the site of the uncompleted ring. These structures were set out on a north-south axis and had served to establish the position of the noonday sun. A two metre long slab, still visible in the centre of the northern circle, is set precisely on a north-south line, and you may care to examine this circle during your visit to the Nether Largie stones.